This is the story of two innovative post-WWII aircraft, each with more than one tale to tell. One has been described as the most graceful airliner ever built, the other as a ‘fork-tailed doctor killer’. The triple-tail Lockheed Constellation model L749 and the V-tail model 35 Beechcraft Bonanza both made their commercial debut 70 years ago. Seventy years on, the Constellation series has dwindled to just two flying stars, one in Australia and the other in Switzerland. But the Bonanza has lived up to its name, with an uninterrupted production run which continues today, the longest for any aircraft. These two classic aircraft say much about how aviation has changed, and how it has stayed the same. Howard Hughes, a major shareholder of Trans World Airlines, is credited with pushing for development of the original Constellation series, because TWA wanted a 40-passenger transcontinental aircraft with a range of about 3000 nm. War intervened, and the aircraft ordered by TWA were instead built as C-69 troop transports, though not all entered service. There was a proposal, never developed, to build an L-249 model as a long-range bomber. After the war the C-69s already in production were finished as civilian airliners, and TWA began its transatlantic service in 1946. The radial-engined Constellation had large propellers and hence a tall landing gear. To compensate, the plane’s characteristic triple-tail design gave a lower profile that could fit into the hangars of the time. However, the aircraft really came into its own a year later for long-distance travel, when Pan Am began the first round-the-world service with its L-749 model Constellation on 17 June 1947. Qantas followed suit the same year, acquiring its first L-749 in October 1947. It began weekly flights to London in December of that year. The L-1049 Super Constellation, essentially a stretched version, was introduced in 1951 in response to the introduction of the Douglas DC-6B, which could carry 23 more passengers than the L-749. Some 579 Super Constellations were built in both commercial and military versions until 1959. The L-1049C model, introduced in 1953, was fitted with turbo-compound engines, in which exhaust pressure was used to turn the propeller through a turbine and gearbox. The engine’s exhaust flowed through three turbines, increasing power but also producing visible flame from the exhaust pipes. Qantas ordered its first Super Constellations in 1951. The first was delivered in 1954 and inaugurated the airline’s Pacific service in May of that year. In 1958, with 16 Super Constellations in its fleet, Qantas flew twin round-the-world flights from Melbourne (now Essendon) Airport, one travelling west and the other east. However, it was the beginning of the end for the mighty radial piston-engine aircraft. The following year, Qantas bought its first jet, a Boeing 707-338. Jet piston and turboprop, in the form of the troublesome Lockheed Electra, flew side by side for four years until Qantas’s last Super Constellation left Sydney on 3 May 1963. By the numbers, a Super Constellation carried about as many people as a typically-configured Airbus A318—the smallest variant of the A320 family—109 in the Connie’s densest configuration and 107 in the Airbus. Empty weights and fuel capacities were broadly similar but the biggest difference is in what it cost to fly on these aircraft. A ticket from Sydney to London in 1963 cost 589 pounds—about 60 per cent of an average annual wage. In 2017, a London flight can be bought for $1029, about 500 pounds in the old money but about 60 per cent of the average weekly wage of $1592.40 (November 2016). The Beechcraft Bonanza made its commercial debut in 1947. For its time, it was an advanced design. Unlike its main post-war rival, the Cessna 195, the Model 35 Bonanza took advantage of WWII fighter technology, with a horizontally-opposed six-cylinder engine, streamlined shape and retractable tricycle landing gear. And unlike the radial-engined Cessna 195, which ceased production in 1954 with fewer than 1200 units produced, the Bonanza is still in production, with more than 17,000 made. More than 300 are on the Australian register. The current, G36 model, of which there are 20 on the Australian register, is a glass cockpit version of the most popular model in Australia, the A36, produced from 1970 until 2005. A 1947 advertisement for the original A35 model, with its distinctive V-tail, described it as ‘the first thoroughly economical four-place plane for business … fully equipped for travel anytime, anywhere, with two-way radio, landing lights, instruments and heater’. Twelve years later, near Clear Lake, Iowa, the crash of a 1947-model Bonanza A35 would put paid to the ‘fully equipped for travel anytime’ marketing hype. In poor early morning conditions on 3 February 1959, the chartered aircraft crashed shortly after setting course to the north-west, killing rock and roll artists Buddy Holly, Richie Valens and JP Richardson, as well as the 21-year-old pilot. It was in bad weather too, that another popular music star, Jim Reeves, died when the A33 Beechcraft Debonair (a Bonanza variant) he was flying crashed in a thunderstorm en route to Nashville on 31 July 1964. In one of the more bizarre accidents involving a Bonanza, Ozzy Osbourne’s guitarist Randy Rhoades was killed in 1982 when the wing of a low-flying Bonanza F35 in which he was a passenger hit the band’s tour bus. The Bonanza acquired the cynical nickname of ‘forked-tailed doctor killer’—a reference to some well-heeled amateur pilots becoming overconfident in their ability to fly a high-performance aircraft. This appears to have been the case in a non-fatal crash in 1981, when Apple co-founder, Steve Wozniak, crashed his Bonanza on take-off. The investigation found that Wozniak was legally unqualified to fly the aircraft and lacked familiarity with it. A recent fatal crash of a V-tail Bonanza, in New York State in May 2016, was sadly typical of these types of accidents: the aircraft, flown by an airline transport licensed pilot, broke up in IMC after the pilot reported a vacuum pump (instrument) failure. The T-34 Mentor was derived from the Model 35 Bonanza and sold as a military trainer. The T-34 civilian fleet was grounded in the US in 2004 after crashes involving structural failure in simulated combat. Wing spar and other modifications have allowed individual aircraft back in the air. The Bonanza is a slippery character, and a disadvantage of a slick aircraft is that its airspeed can diverge quickly towards Vne, particularly at high-power settings on descent. Structural failures in properly-maintained Bonanzas, Folan argues, are due to flying the aircraft outside its performance limits. He says most Bonanza airframes are relatively young, and that the manufacturer has produced various modification kits and that parts are readily available. So, in an age of high-tech competitors, how has the Bonanza survived? Jock Folan says its features such as high-load capacity, range, solid feel and good visibility—and things like proper nosewheel doors to reduce drag. Folan says the V-tail design has further advantages over conventionally-tailed models, including weight and being harder to spin. While the G36 Bonanza looks, sounds and feels broadly similar to its 1947 ancestor, the avionics in front of its yoke (no longer of the unlamented ‘throw-over’ design) are beyond the science-fiction dreams of the 1940s—solid state displays showing moving maps and, optionally, synthetic vision, ADS-B transponders, electronic flight bags, and three axis coupled autopilots. There’s no engineering barrier to fitting systems such as artificial intelligence and voice recognition. Thus 1947 meets 2017. By their nature, 70th birthdays can be a time for evaluation; in the production run of the Bonanza the supersonic airliner has come and gone, and air travel has become a true mass transportation mode carrying 3.7 billion people in 2016. Alas, the same cannot be said for general aviation, anywhere in the world. Private flying remains the passion of a smitten few, rather than an everyday mode of transport for the many, notwithstanding predictions of electric multi-rotor taxis. For the vast majority of private pilots, each flight is an event, a celebration rather than an everyday activity such as driving a car. Private general aviation has not fulfilled the everyday transport dreams of the 1940s, but if flying yourself is instead an aesthetic statement and intellectual challenge to relish, doing it in a 1947 vintage design makes more sense, particularly when it was one ahead of its time. Great articles on two great aircraft. 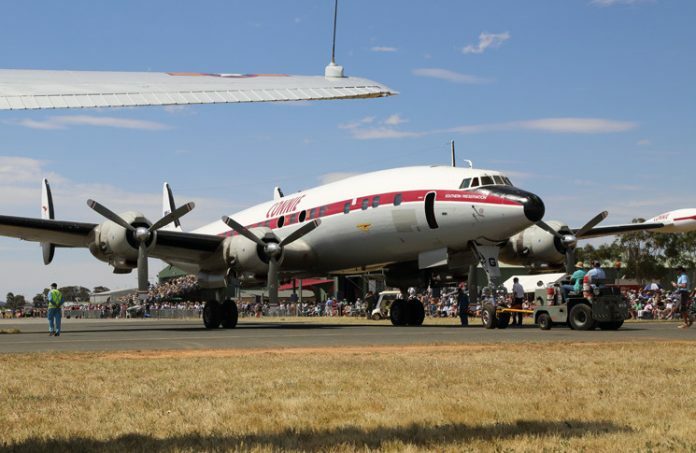 I happen to live in Wagga Wagga where the HARS L-749 Connie currently sits proudly on the tarmac attracting many viewers following a recent re-paint and my E33 Bonanza sits radiantly in the hangar awaiting any nice day to go flying…. QF bought the B707-138 to replace the Connies not the 338. That was the 138’s big brother which replaced the 138 versions.